For other uses, see Parkway (disambiguation). Heavy traffic on the Garden State Parkway in Monmouth County, New Jersey, in the New York Metropolitan Area, United States. This is one of the world's busiest roadways. A parkway is a broad, landscaped highway thoroughfare. The term is particularly used for a roadway in a park or connecting to a park from which trucks and other heavy vehicles are excluded. Many parkways originally intended for scenic, recreational driving have evolved into major urban and commuter routes. The term parkway is sometimes applied more generally to a variety of limited-access roads. In Russia, long, broad (multi-lane) and beautified thoroughfares are referred to as prospekts. Brooklyn's Eastern Parkway, the world's first parkway, according to the New York City Department of Parks and Recreation. Over the years, many different types of roads have been labeled parkways. The first parkways in the United States were developed during the late 19th century by landscape architects Frederick Law Olmsted and Beatrix Farrand as roads segregated for[clarification needed] pedestrians, bicyclists, equestrians, and horse carriages, such as the Eastern Parkway, which is credited as the world's first parkway, and Ocean Parkway in the New York City borough of Brooklyn. The terminology "parkway" to define this type of road was coined by Calvert Vaux and Frederick Law Olmsted in their proposal to link city and suburban parks with "pleasure roads". 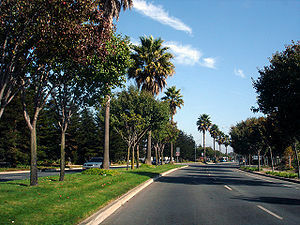 Newer roads such as Bidwell in Buffalo, New York and Park Presidio Boulevard in San Francisco, California were designed for automobiles and are broad and divided by large landscaped central medians. During the early 20th century, the meaning of the word was expanded to include limited-access highways designed for recreational driving of automobiles, with landscaping. These parkways originally provided scenic routes without very slow or commercial vehicles, at grade intersections, or pedestrian traffic. Examples are the Merritt Parkway in Connecticut and the Vanderbilt Motor Parkway in New York. But their success led to more development, expanding a city's boundaries, eventually limiting the parkway's recreational driving use. The Arroyo Seco Parkway between Downtown Los Angeles and Pasadena, California is an example of lost pastoral aesthetics. It and others have become major commuting routes, while retaining the name "parkway". In New York City, construction on the Long Island Motor Parkway (Vanderbilt Parkway) began in 1906 and planning for the Bronx River Parkway in 1907. In the 1920s, the New York City Metropolitan Area's parkway system grew under the direction of Robert Moses, the president of the New York State Council of Parks and Long Island State Park Commission, who used parkways to create and access state parks, especially for city dwellers. As Commissioner of New York City Parks under Mayor LaGuardia, he extended the parkways to the heart of the city, creating and linking its parks to the greater metropolitan systems. Most of the New York metropolitan parkways were designed by Gilmore Clark. The famed "Gateway to New England" Merritt Parkway in Connecticut was designed in the 1930s as a pleasurable alternative for affluent locals to the congested Boston Post Road, running through forest with each bridge designed uniquely to enhance the scenery. Another example is the Sprain Brook Parkway from The Bronx to become the Taconic State Parkway to Chatham, New York. Landscape architect George Kessler designed extensive parkway systems for Kansas City, Missouri; Memphis, Tennessee; Indianapolis; and other cities at the beginning of the 20th century. In the 1930s, as part of the New Deal the U.S. federal government constructed National Parkways designed for recreational driving and to commemorate historic trails and routes. These divided four-lane parkways have lower speed limits and are maintained by the National Park Service. An example is the Civilian Conservation Corps (CCC) built Blue Ridge Parkway in the Appalachian Mountains of North Carolina and Virginia. Others are: Skyline Drive in Virginia; the Natchez Trace Parkway in Mississippi, Alabama, and Tennessee; and the Colonial Parkway in eastern Virginia's Historic Triangle area. The George Washington Memorial Parkway and the Clara Barton Parkway, running along the Potomac River near Washington, D.C. and Alexandria, Virginia, were also constructed during this era. In Kentucky the term "parkway" designates a controlled-access highway in the Kentucky Parkway system, with nine built in the 1960s and 1970s. They were toll roads until the construction bonds were repaid, and are now freeways since 2006. The Arroyo Seco Parkway from Pasadena to Los Angeles, built in 1940, was the first segment of the vast Southern California freeway system. It became part of State Route 110 and was renamed the Pasadena Freeway. A 2010 restoration of the freeway brought the Arroyo Seco Parkway designation back. Sign informing truckers it is illegal to use a parkway in New York City. In the New York metropolitan area, contemporary parkways are predominantly controlled-access highways restricted to non-commercial traffic, excluding trucks and tractor-trailers. Some have low overpasses that also exclude buses. The Vanderbilt Parkway, an exception in western Suffolk County, is a surviving remnant of the Long Island Motor Parkway that became a surface street, no longer with controlled-access or non-commercial vehicle restrictions. The Palisades Interstate Parkway is a post-war parkway that starts at the George Washington Bridge, heads north through New Jersey, continuing through Rockland and Orange counties in New York. The Palisades Parkway was built to allow for a direct route from New York City to Harriman State Park. 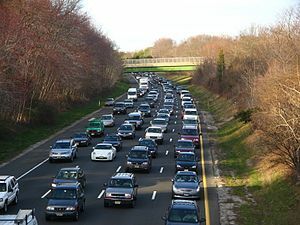 In New Jersey, the Garden State Parkway, connecting the urban Northeast U.S. with the Jersey Shore and Atlantic City, is restricted to buses and non-commercial traffic north of the Route 18 interchange but is one of the busiest toll roads in the country. In the Pittsburgh region, two of the major Interstates are referred to informally as parkways. The Parkway East (I-376, formally the Penn-Lincoln Parkway) connects Downtown Pittsburgh to Monroeville, Pennsylvania. The Parkway West (I-376) runs through the Fort Pitt Tunnel and links Downtown to Pittsburgh International Airport, southbound I-79, Imperial, Pennsylvania, and westbound US 22/US 30. The Parkway North (I-279) connects Downtown to Franklin Park, Pennsylvania and northbound I-79. In the suburbs of Philadelphia, U.S. Route 202 follows an at-grade parkway alignment known as the "U.S. Route 202 Parkway" between Montgomeryville and Doylestown. The parkway varies from two to four lanes in width, has 5-foot-wide (1.5 m) shoulders, a 12-foot-wide (3.7 m) walking path called the US 202 Parkway Trail on the side, and a 40 mph (64 km/h) speed limit. The parkway opened in 2012 as a bypass of a section of US 202 between the two towns; it had originally been proposed as a four-lane freeway before funding for the road was cut. In Minneapolis, the Grand Rounds Scenic Byway system has 50 miles (80 km) of streets designated as parkways. These are not freeways; they have a slow 25-mile-per-hour (40 km/h) speed limit, pedestrian crossings, and stop signs. In Cincinnati, parkways are major roads which trucks are prohibited from using. Some Cincinnati parkways, such as Columbia Parkway, are high-speed, limited-access roads, while others, such as Central Parkway, are multi-lane urban roads without controlled access. Columbia Parkway carries US-50 traffic from downtown towards east-side suburbs of Mariemont, Anderson, and Milford, and is a limited access road from downtown to the Village of Mariemont. The Icefields Parkway runs through the Canadian Rockies in Jasper National Park and Banff National Park. "Parkway" is used in the names of many Canadian roads, including major routes through national parks, scenic drives, major urban thoroughfares, and even regular freeways that carry commercial traffic. Parkways in the National Capital Region are administered by the National Capital Region (Canada). However, some of them are named "drive" or "driveway". The term in Canada is also applied to multi-use paths and greenways used by walkers and cyclists. The United Kingdom has parkways in many large towns and cities. Most examples are motorways or A roads. Some parkways including Chelmsford Parkway have flyovers leading to major roads. Several mainly park-and-ride-status railway stations in England have the suffix "parkway" in their name. The etymology is from the original U.S. meaning as the Bristol Parkway railway station was named after the adjacent M32 motorway, originally known as The Parkway because of its green-buffered route into the city. Bristol Parkway was the first railway station so named, in 1972. The majority of such stations were opened in the late 20th century to relieve pressure on existing city centre stations. Examples such as Didcot Parkway are renamings following the expansion of the car parking facilities where the name is used promotionally (for example commuters to Oxford are encouraged to leave their car at Didcot and travel to Oxford by train) whereas in others with multi-storey car parks serving modest settlements such as Brookwood and Fleet the suffix has not been adopted. Luton Airport Parkway and Southampton Airport Parkway are examples serving Luton and Southampton airports. Some were so named as they are not in easy walking distance of an airport terminal; passengers use shuttle bus services, although Southampton Airport station is within easy walking distance of Southampton Airport and has no separate car parking facilities of its own. The city and third-generation new town of Peterborough (population of 184,500 as at 2011 census) has an overall free-capacity system roads branded as "parkways", which together with other roads provide routes for much through traffic and local traffic sufficient to cope in most peak hours. The majority are dual carriageways, with many of their junctions numbered. Five main parkways (Soke Parkway, Nene Parkway, Fletton Parkway, Frank Perkins Parkway, Paston Parkway) form an orbital outer ring road. Orton Parkway, Werrington Parkway, Longthorpe Parkway are named after the settlements they serve. For example, Werrington Parkway is an arbitrary renaming of a short section of the A15 Lincoln Road. In the City of Plymouth, the A38 is called "The Parkway" and bisects a rural belt of the local authority area, which coincides with the geographical centre; it has two junctions to enter the downtown part of the city. The Australian Capital Territory uses the term "parkway" to refer to roadways of a standard approximately equivalent to what would be designated as an "expressway", "freeway", or "motorway" in other areas. Parkways generally have multiple lanes in each direction of travel, no intersections (crossroads are accessed by interchanges), high speed limits, and are of dual carriageway design (or have high crash barriers on the median). Victoria uses the term "parkway" to sometimes refer to smaller local access roads that travel through parkland. Unlike other uses of the term, these parkways are not high-speed routes but may still have some degree of limited access. Singapore uses the term "parkway" as an alternative to "expressway". As such, parkways are also dual carriageways with high speed limits and interchanges. The East Coast Parkway is currently the only expressway in Singapore that uses this terminology. Look up parkway in Wiktionary, the free dictionary. ^ a b "parkway. "Webster's Third New International Dictionary, Unabridged. Merriam-Webster, 2002. http://unabridged.merriam-webster.com (14 Apr. 2007). ^ Alexander, Jeanne. "History of Park Presidio Boulevard". ^ Thornton, Tim; Howell, Isak. "Parkway's Past Haunts Its Future". Archived from the original on October 9, 2012. ^ "Title 16. Department of Transportation; Chapter 32. Truck Access" (PDF). New Jersey Department of Transportation. Archived from the original (PDF) on September 20, 2008. Retrieved August 13, 2010. ^ Mucha, Peter (December 3, 2012). "New Route 202 parkway opens today". The Philadelphia Inquirer. Retrieved December 3, 2012. ^ Savana, Freda R. (March 2, 2008). "Make way for the 202 Parkway". The Intelligencer. ^ Kristofic, Christina (November 1, 2007). "PennDOT to hold meetings on noise from parkway". The Intelligencer. ^ "Information Center: About the Grand Rounds". Archived from the original on 2015-02-14. Retrieved 2007-12-18. ^ "Second Ward, Minneapolis: Traffic Calming Event". Retrieved 2007-12-18. The Straight Dope "Why do we drive on the parkway and park on the driveway?" This page was last edited on 10 February 2019, at 22:34 (UTC).